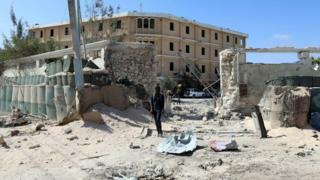 Al-Shabab militants in Somalia have attacked a government building in the capital, Mogadishu, killing at least 11 people. Deputy labour minister Saqar Ibrahim Abdala and several policemen were amongst those killed, officials said. The militants first staged a suicide car bomb attack and then stormed into the ministry offices. Al-Shabab has continued to mount regular attacks in Mogadishu since it was forced out of the city in 2011. Target Somalia: The new scramble for Africa? Five rebels were reported to have been involved. Somali officials said they had all been killed and the area secured. The US has sharply increased its air strikes against the group, which is linked to al-Qaeda, since President Donald Trump took power. Officials in Somalia say that al-Shabab has increased its attacks in Mogadishu as retaliation for the air strikes. The US State Department says al-Shabab retains control over large parts of the country and has the ability to carry out high-profile attacks using suicide bombers, explosive devices, mortars and small arms.